Any Disney Pixar fan would love this cool colorful Finding Dory clock. 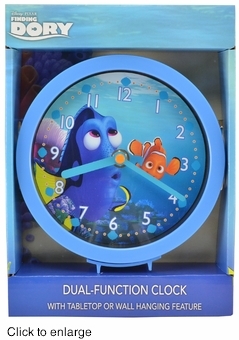 This beautiful blue licensed Finding Dory clock is faced with a plucky pic of Dory and Nemo. The clock has accurate quartz timekeeping and can be either wall mounted or will stand up on a tabletop. The clock body is 6 inches.